This is a guest blog by Eliza Perry, one of our Hubbard Fellows. All photos are by Eliza. Last week I needed to check the fences around one of our properties. I only needed to walk a quarter of it to see that we had a lot of work to do. were next to a bunch of small, amorphous tracks. The tracks were bigger than cat tracks and smaller than dog tracks. tunnels. To me, it looked like something was dragging its belly, like a snake. Here’s it is a little closer, at a point that does look like a collapsed tunnel. But the rest of it was just an indentation on the snow. 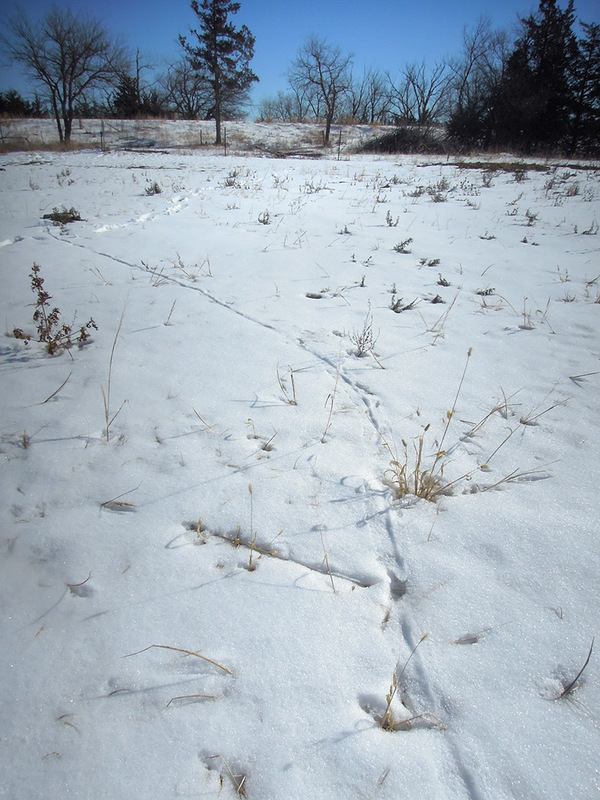 This entry was posted in Prairie Animals, Prairie Natural History, Prairie Photography and tagged eliza perry, hubbard fellowship, mystery tracks, prairie, snow, tracks, winter by Chris Helzer. Bookmark the permalink. I’m thinking raptor feathers for the things that look like claw marks. I would second the raptor feathers. The claw-like marks certainly look like wing marks to me. Probably an owl at night swooping down to bag or nearly bag whatever made the small mammal tracks. Definitely look like wing tip/feather marks. I investigated a golden eagle/cottontail kill/breakfast site in Western Colorado this past January when I saw a pair of eagles take flight out of a snowy sagebrush patch. There were many wing marks in the snow from where the eagles attacked the rabbit, subdued it, and then ate everything but a skull cap of the prey Desert Cottontail. I’m thinking one of the owl species, hunting at night. Short eared owls love grasslands. Maybe a barn owl. The tunnel is some sort of rodent tunnel. Thanks, guys! I hadn’t thought of that. And you do think raptor wings can make such defined, narrow marks? I’m with the others about the raptor feathers making the claw-like tracks. We see this often around our prairie at home. And I agree with Chris – some sort of collapsed tunnel. Most definitely the wing tips in unpacked, fluffy snow can make those marks. 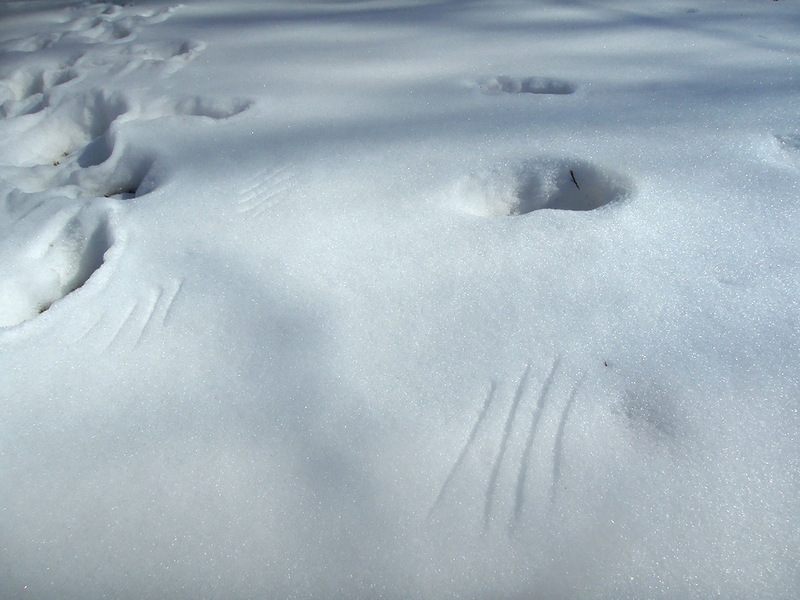 Here are some pictures from a little trail report I made with eagle wing marks in a fresh snow. According to my copy of Stokes Guide ot Animal Tracking by Donald and Lillian Stokes, tunnels in snow can be Rabbit, Weasel, Red Squirrel, Vole, Mouse and Shrew. Rabbits would be wider, about 6 inches. Weasels are generally shorter tunnels, to access the smaller animals under the snow. Red Squirrels like conifers so would not be out in the prairie. Mice mostly run over the snow, only occasionally tunnelling into it. That leaves Voles and Shrews. Voles are a little bigger, but all the tunnels widen as they start to melt. Voles sometimes dig up to the surface of the snow. In prairie, I’d pick Vole over Shrew. I have prints like these in my backyard all the time. 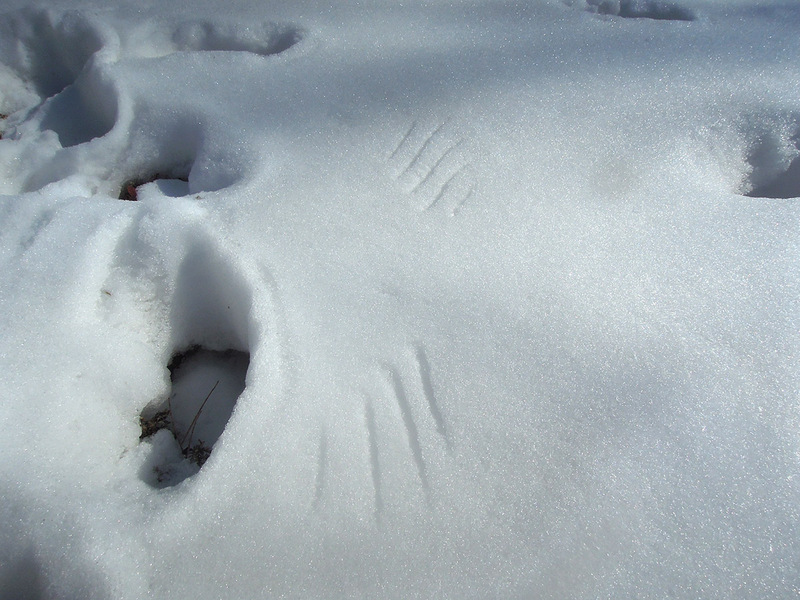 Crows ambling through the snow and leaving wing prints when they take off. 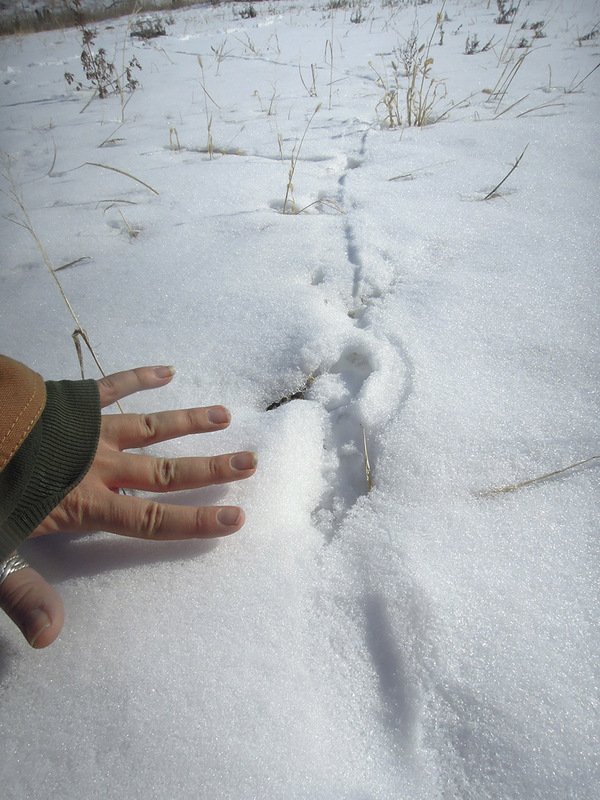 Here is a blog entry from several years ago with photos of the tracks left behind when a Red-tailed hawk finds a mouse (or other small mammal) in the snow… Someone saw the hawk dive, so we know just which raptor left the tracks.